Banks have pulled out of towns and villages across the north and north-east in recent years while blaming declining customer footfall. At the same time, 290 cash machines have been taken away from high streets, more than two-thirds of which were free to use. Now consumer organisation Which? has completed a study which has found that 339 branches have shut nationally since the beginning of 2015. It has called for government intervention to ensure the total does not decrease further, leaving banking wastelands across swathes or rural Scotland. Communities across the country are already experiencing problems as a result of the decline in banking services. Many have seen their access to services restricted, while mobile banking facilities have proved a singularly unpopular and ineffective replacement, offering limited time to individual towns and villages. 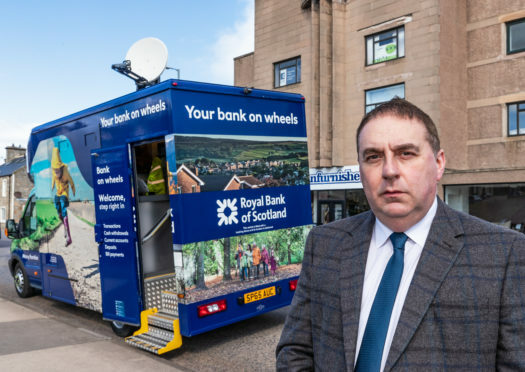 On Speyside, the move to online and mobile banking has seen tourists struggling to access cash after the Clydesdale became the last to shut up in Aberlour. That has seen ATMs in neighbouring villages struggling to cope with demand. The bank eventually returned the “hole in the wall” to the high street after its former building was reopened as a cafe. However, Jenni Allen, managing director of Which?, believes action is needed from the UK Government to protect access to cash. She said: “We have serious concerns that the alarming rate of cashpoint and bank branch closures risks leaving people in Scotland facing an uphill battle to access the cash they rely on. The Treasury has stressed that decisions to open and close branches is a commercial decision and should not be subject to government interference. Which? has argued that physical money remains a “vital backup” to the rising popularity of digital payments. The group’s study has found that withdrawals from cash machines in Scotland dropped by 3.3% during 2017/18 – less than half the total for London and the south-east of England. Lossiemouth-based councillor James Allan has campaigned for communities to have access to cash facilities as his hometown faces losing its final bank in the summer. He said: “There are three cash machines in the town at the moment. “One is going to go when the Bank of Scotland closes and the Post Office is up for sale, so we don’t know what will happen there. “That would leave just one and it’s already hard to get cash at evenings and weekends.